When considering alcohol rehabilitation, we at Rehab Guide have been greatly inspired by the healing power of the internationally lauded 12-step treatment programme. It has long been renowned for aiding in the recovery of alcoholics and addicts across the globe. 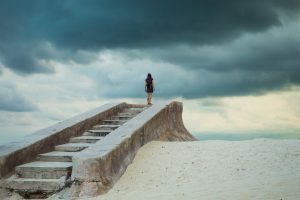 Where the 12-step therapy is felt to have succeeded where customary methods of medical and psychological treatment have failed, which has only added to its status. The international mutual aid fellowship called Alcoholics Anonymous (AA) was formed by Bill Wilson and Dr Bob Smith in Akron, Ohio in 1935. Where it first originated its 12 Steps recovery programme, which members follow to abstain from alcohol, and is now recognised as one of the leading treatments for alcohol addiction in the world. However, the principles of the 12 Steps programme also applies to other addictions and, in some cases, can help persons suffering from further mental health problems. The aim of the 12-step therapy programme is to change the mindset of the person battling addiction. Where the first step is for the sufferer to face up to the fact, and admit that they are unable to control their addiction. They are then ready to live a spiritual life, endorsing such traits as honesty, open-mindedness, compassion and altruism. The 12 Steps offers well-defined directions on how to achieve these goals, as well as helping you find your inner strength and guidance. Rehab Guide can familiarise you with the 12-steps and, should you proceed with a more extensive treatment programme, you will have the chance to be taken through the entire 12-steps. The programme is designed to help you abstain from mind and mood altering substances, such as drugs and alcohols, while also treating obsessive and self- destructive behaviour. The 12-steps allow you to remove addiction from your everyday life and replace it with a sense of meaning and purpose, to help bring about your recovery. As part of your rehabilitation, Rehab Guide can offer 12-step therapy alongside other advanced treatments. We can assist you through our detox therapy programmes. Our experts are also experienced in trauma resolution, integrative counselling models, CBT and holistic therapies. By incorporating these formidable treatments, we offer an exciting addiction rehab programme to aid you in your recovery, where the programme is carried out in such a structured and powerful way as to conquer the compulsive and overwhelming force of addiction. Rehab Guide offers a healthy and positive option, where we encourage our clients to put aside those damaging, self-destructive activities and concentrate on taking steps to improve their lives for the better. Which they can do with our help, by embracing the principles of the 12 step programme, and choosing an alcohol rehab treatment from Rehab Guide.